If you've been struggling with urge incontinence it can be hard to know what to do. Often the urgent feeling is so strong that it feels impossible to resist it - nobody wants to end up having an accident in public! Unfortunately by giving into this panicky, 'need to go NOW!' feeling all the time you will actually be making this problem worse. When you go in response to this urge, your bladder starts to think that it has a far smaller capacity than it really does. It's a vicious cycle! But you can stop it via something called bladder training; just follow our guide. The main aim of bladder training is to slowly increase the amount of time between your toilet visits. This can feel difficult and unnatural at first as you may be worried about having accidents or leaks. It's important to remember that urge incontinence is mostly in your head - ignoring that panicky feeling is unlikely to lead to accidents as long as you try hard to remain in control. You should aim to delay going to the toilet for an increasing amount of time until you can go for 3-4 hours without peeing. The average person wees around 5-8 times in 24 hours and doesn't need to get up during the night more than once (and preferably not at all). If you are going to the toilet multiple times a night then you are definitely in need of bladder training. 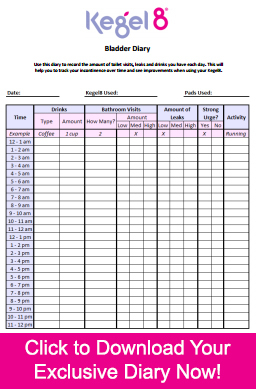 The best way to get started with bladder training is to use a bladder diary. This will help you to find out how often you go and what patterns and triggers you have. We've put together an exclusive bladder diary for you to use, which includes all of the information you need to start bladder training. Use it every day for a week to give you an idea of what your goals should be. Drinks – Had you had something to drink before? Was it just water, or was it something that irritates the bladder like caffeine or alcohol? This will alert you to any triggers. Bathroom Visits – How many times in that hour did you go to the toilet? Did a normal amount come out, or just little bit? This shows you if you really needed to go or if it was your urge incontinence. Amount of Leaks – Record any accidents you had and how much came out. Strong Urge? – Tick whether or not you felt that panicky urge incontinence feeling. Activity - Some women have triggers that give them the urge to urinate, e.g. exercise, being near running water or putting their key in the door when they get home. Record these to find out if there are specific scenarios you need to concentrate on when retraining your bladder. You can also record whether you have used your Kegel8 that day. Doing pelvic floor exercises with a Kegel8 will help you with bladder training as stronger pelvic floor muscles make it easier for you to hold urine in. This will help you to feel more confident about not giving in to your urges. After a week of recording your toilet visits in the bladder diary you can start your training. Don't put too much pressure on yourself to begin with - look at what your average time between peeing is and reduce it by 10 minutes or so. Pay attention to whether certain activities trigger you. For example if you are always getting the urge when you get home from work try waiting for a minute before going, then when you have done that successfully up it to two minutes. It can also help to reduce any food or drink triggers you are notice, for example by reducing the amount of coffee you drink or spreading it out more over the course of the day. Once you have gained more control over your bladder you can start to relax more about these things, but when you are starting every little bit will help. We wish you luck with your bladder training - click here to find out other ways Kegel8 can help you with your incontinence!